Update on May 26, 2016...yet another surprise from this board. After flashing and for programming the board I observed TX on USB converter has to be connected to TX on ESP board, same with RX pin. Yes you typically see you have to pair TX with RX and viceversa but not with this board. I always find myself seeing that nothing will work the first time I try... and playing with ESP8266 modules was not going to be the exception. This post will therefore cover the eventual right steps I took towards making these modules work as I haven't seen any other blog out there covering these specifically. As you can see it is an ESP8266-12 development board that comes with a battery holder. (Details of this device below in the last section). Before purchasing the above module there were some failed attempts included ESP8266-1, ESP8266-3 and ESP8266-12. The "beauty" of these modules and I guess with hardware-ish projects is that the chance of failure is now increased by physical factors: bad soldering, overheating, wrong connections, faulty power source, manufacturing error ... yeah I think I have been bitten (and maybe learnt) from all those. I leave a picture here of two defunct modules, still they can serve as an example/reference of how they can be assembled. I overheated the ESP8266-12 but still I feel proud I was able to solder that many jumper wires somewhat nicely (they are male to male plugged to that small white breadboard). In this section I will detail the steps I took and config changes I made to start using the module, for a list of the tools I used/purchased have a look at the section below. Note this module comes with a pre-installed somewhat shady (I would say) firmware that requires a mobile app to work. In some pages they direct you to an APK that requires an excessive number of permissions to run, I would be wary to install that APK on your phone. Therefore the first step I took was re-flashing, note I am using Linux for flashing and Windows for programming. 1: Ground from the USB to serial converter to GPIO0 (zero) of the ESP module, yes this is required in addition to step 4. 2: Make sure the USB to serial converter is set up to work on 3.3volts. 3: Double check that RX on the USB to serial converter is connected to RX on the ESP module, and that TX on the converter is connected to TX on the ESP. (Yes not the typical way of pairing TX and RX pins). 4: The jumper that comes with the ESP board should be plugged for flashing. 6: this will be used later, leave it disconnected for now. *Instead of preferred normal AA batteries I used rechargeable batteries, I measured the output from the voltage regulator and it was providing the required 3.3 volts to the development board. The exact image I flashed can be found here if you need. Disclaimer I don't work for any 3 letter agency. After the layout is ready and the USB to serial converter is connected to your computer it is time to proceed to flashing. The windows flashers tools didn't work for me so I used a Kali Linux VMware Player virtual machine to run the esptool.py script, make sure you enable the USB to Serial converter on VMware. To do a preamble check that esptool works attempt to execute the read_mac command. To do so first restart the module (i typically do by separating a battery away from the coil in the battery holder and attaching it again) and execute the command highlighted below. It will take sometime (because of the source code changes we made) however it should work. Now it is time to test it! Turn off the ESP module and detach the USB to serial converter from VMware so that it is visible by your windows native system (if you are using windows, if Linux/Mac you can do this by using minicom or other terminals). Connect the pin marked as 6 to ground. In other words the wire that was previously connected to GPIO0 (zero) now should be connected where number 6 points. 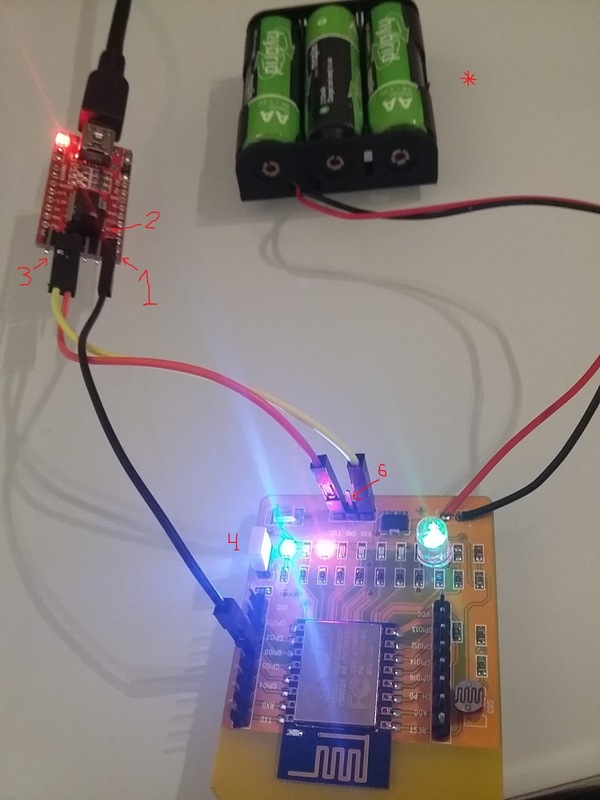 Verify that TX from USB converter is connected to TX on ESP module, do the same with the RX connectors. Yes this is not the typical way to connect it, but once again this board got me with this. Once all the arrangements are done power on the ESP module. Verify in which COM port the USB to serial converter is connected to, go to the windows control panel/device manager (use the shortcut Windows Key + Pause to get faster to control panel) and observe the Ports (COM & LPT) section. Download the ESPlorer tool from here and run the bat file. Once inside ESPlorer select the COM port, COM4 in my case, specify a 9600 baud speed and click on the "open" button. You should see something like the following and be able to write your first print("hello world") command. Note: if you don't connect the ground wire the ESP8266 module will ignore any command you provide to it... yeah this was the last thing bothering me until I got it all working. That's it, now you can go ahead and code whatever you need on it. Hopefully this guide was useful for you, next posts I will try to cover some cool stuff you can do with modules like these. Continuing with the tradition of at least one post per year I wanted to write about a pilot I built and keep on refining based on ElasticSearch (1.1.1), Logstash (1.4.0) and Kibana (3.0.1). I wanted to get my hands dirty with these as I have increasingly seen traditional SQL based security applications/tools failing when attempting to scale. NoSQL databases and big data technologies are becoming a must if you want to properly take care of enterprise security in which you can get large quantities of log data per day. Being the three of them Open Source and well supported I decided to give them a try and put something together. The pilot I will present here is a sort of "SSH scanners statistics" that will display several charts and a geo-location map based on the source IP address of systems scanning for open SSH ports on the Internet. In order for that file not to grow without control create the following file /etc/logrotate.d/iptables. In order to run, stop or restart logstash and elasticsearch once they are installed you can use the /etc/init.d/logstash [start|stop|restart|status] or the elasticsearch equivalent. Note that to have them starting autonomously after any system reboot you will need to enable them via update-rc command. Note that if running your machine on top of an OpenVZ node the Elasticsearch start script could fail stating sysctl: permission denied on key 'vm.max_map_count' my quick and dirty solution for this was commenting out the offending lines on /etc/init.d/elasticsearch init script. Once the services are running. If you issue a netstat command you will notice elasticsearch listening to any incoming connection on two different ports. Let's take care of the logstash piece before jumping into the presentation layer (Apache & Kibana). Logstash would be the agent feeding log information to elasticsearch. Let's see how we can tell logstash to store our iptables logs into elasticsearch. Create the file /etc/logstash/conf.d/geoiptables.conf. #this file contains the iptables logs as defined in our syslog.conf file. #This should be shipped in the deb file we downloaded. #note that the below field additions and mutations are required for Kibana to properly plot the information. #again for security purposes our elasticserach installation only runs on localhost. Note that for my purposes I used the pre-built iptables regex snippet available on the address you will see below. However it did not work out of the box as my iptables logs don't contain the source MAC address, neither the inbound interface. Therefore, I created the file /usr/share/grok/patterns/iptables and modified it as follows (basically stating that those fields are optional with the "?" symbol. This means everything is working fine and the information is well parsed by logstash and stored in elasticsearch, now you should be ready to stop logstash command line with ctrl+c and start the daemon with /etc/init.d/logstash start. See the troubleshooting section below if you run into issues. For the SSL piece we will be self-generating a certificate (ideally you would buy one or generate one signed by your CA of choice and trusted by your browser). You also can think of either disabling port 80/tcp or creating a redirector to port 443/tcp as follows. Create the file /etc/apache2/sites-available/redirect2ssl.conf and later enable it with a2toensite. Let's not forget about downloading Kibana and setting it up for our needs. 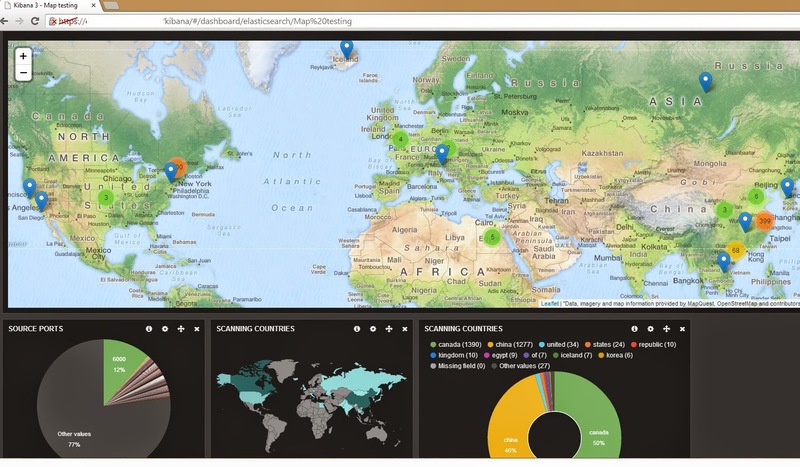 After Kibana has been set up let's connect to it by going to https://www.yourserver.com/kibana/. You should be prompted for the username and password we set up with the htpasswd command. And then you should see something like the following. If you scroll down to the bottom you will see a button that says add a row, a row is the container in which we will incorporate our panels (the maps and charts) for the iptables log information. Go to the Rows tab, give the new row a Title and a Height, 650px could do, and then click on Create Row. Now at the bottom you should see the new row in which we will add the map panel. Click on the Add Panel green button and select Bettermap. Give it a Title, for instance SSH Scanners For the Coordinate Field write geoip.coordinates, as per the span (horizontally) selecting 9 should be fine, finally click on save. As per the charts it is also pretty straight forward. Similarly to how we added the map this time choose a terms panel, give it a Title such as Scanning Countries, for the Field select geoip.country_name, the style would be pie then click on Save. Run logstash from command line (explained in this post) with the stdout output plugin enabled. Your failed parsing logs would be still stored in elasticsearch but with a tag stating _grokparsefailure so when observing this don't think it is an error on elasticsearch side, revise logstash configuration file for glitches. If you are using syslog-ng make sure you configure the user and group for the files so that logstash can read them. Otherwise you will get a failed to open /var/log/iptables.log: Permission denied error on /var/log/logstash/logstash.log. Be careful if you modify your logstash configuration to respect when the configuration stanza requires using double quotes, brackets and square brackets. Alexis and I were having a bright moment after siesta time and decided to put in practice a "brand new" attack... well probably somebody has already done this, but at least we haven't seen it out there before. As usual it had to be something fun and probably silly to keep us motivated. Ladies and gentlemen, please welcome "Blind Site Scripting" a.k.a. BSS! ... never before XSS would talk to victims! So as you can see using text to speech or recorded files we can play them and use them as a payload in our XSS scenarios thanks to HTML5 features such as the Audio element. Of course the you must first find a XSS vulnerable page. Here we are using IBM's Appscan vulnerable site. You would also need a text to speech service, I know at some point speechutil.com will go down and it won't work. Tested on Firefox. IE and Chrome would stop non obfuscated XSS like this.